My uncle Doug died. My middle name comes from him, my mom told me when I was a boy, and thus he became my favorite way back then simply because of that similarity. Apparently when his body was discovered he’d been dead for around three days. The last times I saw him in person was 1987 for my grandma’s funeral, and a couple years before that solemn occasion when I took a train trip all around the country: LA to New Orleans to Washington DC to Chicago to Denver to San Francisco and back to LA. During that epic tour I spent some times in Tennessee and Alabama visiting relatives and seeing the sights. 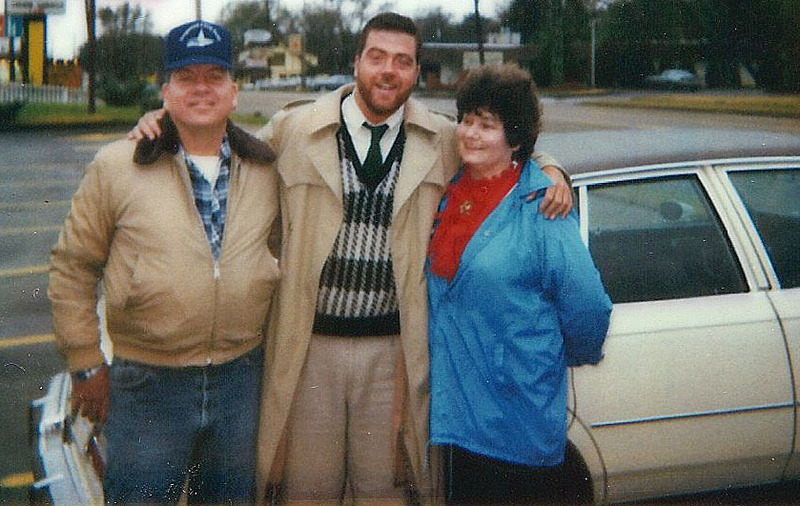 One stop along the way was a visit to the town of Jasper, Alabama, near to where he lived and I met up with him and his wife Jeanne (who passed a few years ago; that’s the three of us pictured below during that stay). Uncle Doug, me, and Aunt Jeanne. Somewhere in Alabama. Sometime in December 1985. We had dinner together at the hotel the second night I was there. The next morning we met up and I went for a ride with him around Carbon Hill, the family hometown, and I got reacquainted with those environs I’d last visited for a section of summer spent with my grandma back when I was seven. Uncle Doug was always gruff with me the few times we’d spoken on the phone over the course of my life. The conversations were awkward during mostly difficult low times of my life where he’d call most likely at my mother’s behest and do his best to counsel me on the right mindset and actions to take. I did my best to listen. And that was pretty much the extent of our relationship. The relationship between him and my mom, took a frustrating turn around 2003 when my mother moved back there to reconnect with the home turf she’d left for California as a young lady and to help him and Jean with various things. Instead things ended up with nasty words, accusations and angry feelings exchanged. And my mom, realizing why she’d left Alabama in the first place, came back to Los Angeles with the door firmly shut on the south at-large and her brother. The feeling was mutual, I’d guess. So it is that the last 10 years of uncle Doug’s life, I’d never said a word to him. My mom may have sent flowers in both our names when Jeanne died, but that was her doing. When my mom called me this last weekend with the news of his passing, it took me a day or so to get choked up, and even then it felt kind of forced. Maybe because we’d never been that close. Maybe because the way my schedule is, I didn’t have time to grieve much less attend any services that might be planned. Even when she called back to say I was named in his trust to receive 15 acres of what she called well-timbered land in Walker County, Alabama, replete with a creek running through it, I greeted that news clinically and wondered why me? But then on my way to training yesterday afternoon, I was transitioning from the 101 to the eastbound 60 and I thought about old pictures I have stored away in an album somewhere. Of him and me when I was a couple three years old standing next to his super sweet 1966 Mustang Fastback. I’m not sure why that image and why then, but the waterworks just came on hard, and for the next few miles I found it so utterly depressing that in my entire life, my connection with my favorite uncle consisted mostly of a few pictures and uncomfortable phone calls. Maybe the feeling was mutual when he was alive. Well, I am sorry, uncle Doug. I am so very sorry. One of these days I’ll beat it down to the basement and dig those pix out and up into the light. And another one of those days I’ll beat it down Bama way and be found standing upon the land my uncle Doug saw fit to pass on to my undeserving self. I’ll listen to the creek burble and hear the wind through the boughs, and I’ll figure out a way to honor him and his gift that’s far better than that which I’ve attempted to do here. This entry was posted on Thursday, January 31st, 2013 at 11:45 am and is filed under family, obituary. You can follow any responses to this entry through the RSS 2.0 feed. Both comments and pings are currently closed.